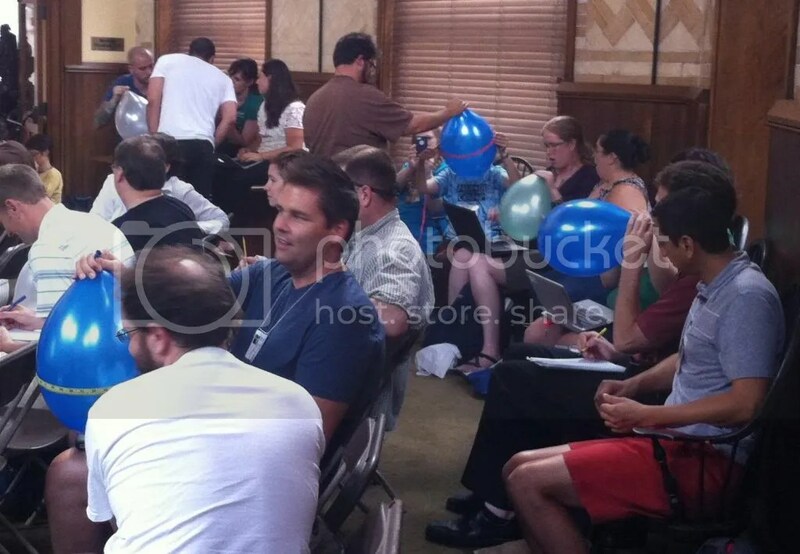 This past week, over 100 math teachers descended upon the Drexel University campus for Twitter Math Camp 2013. It was a fantastic opportunity to meet people I had communicated with via Twitter for some time, make new friends, and share math ideas. It’s a real rush to hang out with colleagues who share similar ideals on math instruction, and a commitment to improve our practices. Check out the hashtag #tmc13 on Twitter to look back on some of the action and reactions, and find new math folks to follow. While there’s so much to share from TMC13, I know there are many math friends who couldn’t attend who are looking forward to hearing about the goings-on, so in this post I share 4 ideas from this year’s Twitter Math Camp I am eager to try in my classroom right away. That’s it. No worksheet. No convoluted instructions. 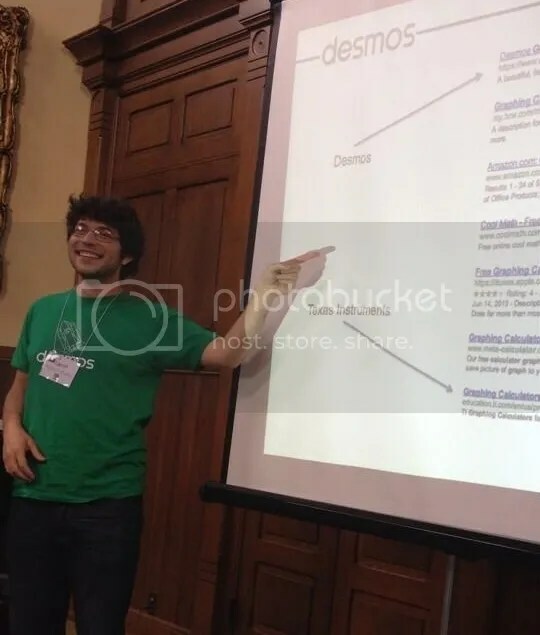 Eli walked us through an exploration of the data set using Desmos, using the table to record the data, and considered various function models: is a square root model? Is it logarithmic? The group eventually settled upon a cube root as the proper model – and how often in class do we encounter data best modeled by a cube root?! Since the explanatory (air entering the balloon) is volume, and the response variable (girth) is linear, the cubic model makes perfect sense. Fun stuff. But wait…there’s more! Eli then analyzed the fit of curve by looking at the squares of the residuals. Click the graph below to check out my best-shot recreation of Eli’s presentation, and play around with the fit of the curve by toying with the “a” slider. 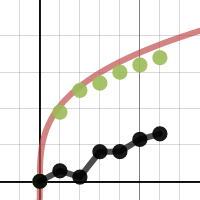 More great new additions to Desmos are coming. Thanks to Eli for letting us preview some of them! Was a pleasure meeting you and hearing about your fascinating story. GLENN’S PROBLEM POSING – Glenn Waddell is a colleague I feel I have a lot in common with, in that we have both experienced the frustrations of trying to “spread the word” to colleagues of the great new ideas, and strong need, for inquiry-based mathematics. 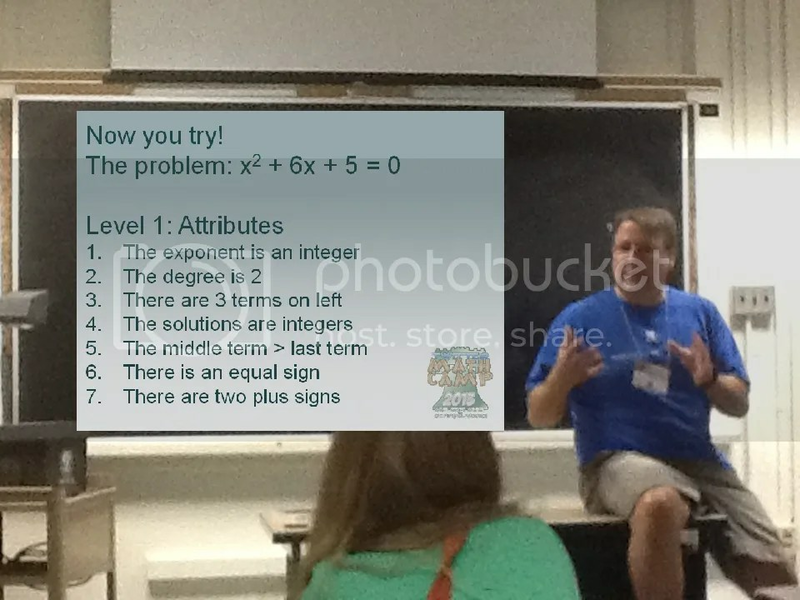 In this session, Glenn presented a framework for problem posing in mathemtics which can be employed equally-well with real-life problems (see the “meatball” example in Glenn’s Powerpoint, which was adapted from a Dan Meyer “math makeover” problem) or with a garden-variety drill problem. The framework asks that teachers lead students in a discussion that goes beyond just the problem in front of us. Think about the many attributes of a problem, list them, consider changes to them and their consequences, and generalize results. 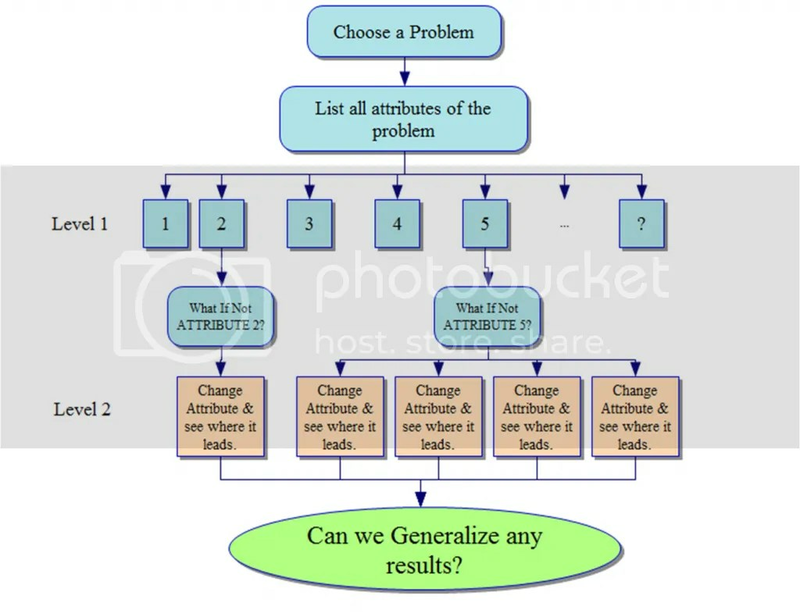 Glenn suggests the book “The Art of Problem Posing” by Brown and Walter as a resource for getting started, which employs the problem posing framework. Glenn led the group through an exploration of a quadratic equation, where we started by listing its many attributes. What would happen if there were a “less than” sign, rather than equals? What would happen if the last sign were minus? What is it were an x-cubed, rather than x-squared? There’s no limit to the depth or number of adaptations, and that’s why I like this method of problem posing for all levels of courses. Download Glen’s presentation on the TMC wiki, and explore the wiki to get the flavor of many of the sessions. 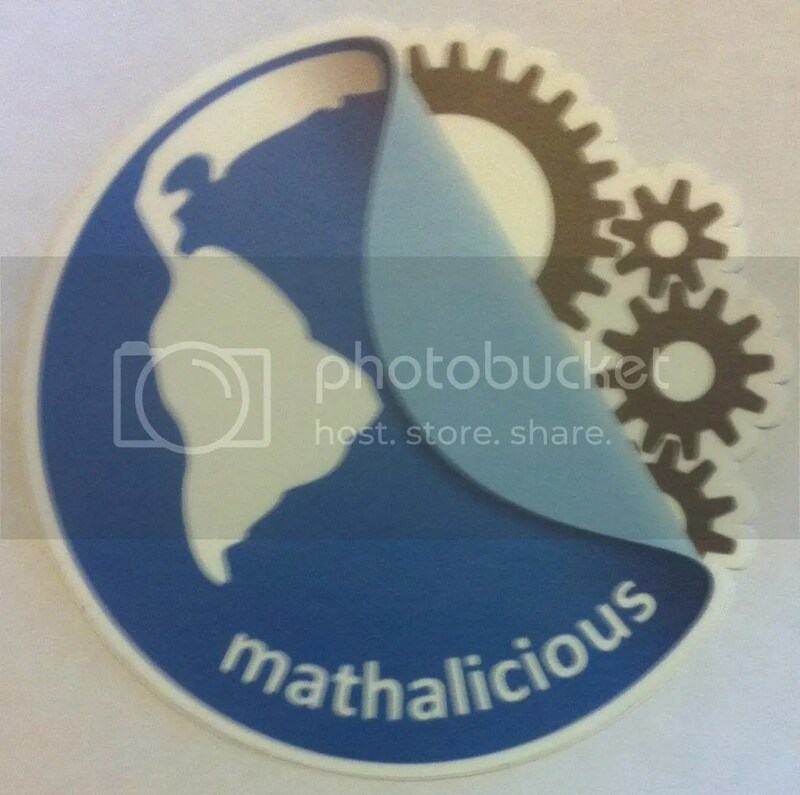 If you have never visited Mathalicious, go now….take a look at some of the free preview lessons, and you will become lost in the great ideas for hours. THEN, make sure you sign up and get access to all of the engaging lessons. Here is a company that is doing it right: lessons come with a video or visual hook, data which naturally lead to a discussion of tghe underlying mathematics, and just the right amount of structure to encourage students to contribute their thoughts and ideas. At TMC, Mathalicious founder Karim Kai Ani led the group through two lessons. A brief summary is given here, but I encourage you to check out the site and subscribe….you’ll be glad you did. The “Romance Cone” – What is the appropriate age difference between two romantic partners? Is there a general rule? A fun lesson, “Datelines” on Mathalicious, where students explore a function and its inverse, without using those scary-looking terms. I have been looking for an opening activity for our Algebra 2 course, which brings back ideas of function, inverses and relationships, and looking forward to trying this as a my first-day hook. Also a great activity for Algebra 1. PRISM = PRISN? – I have led my probability students through an exploration of false positives in medical testing for many years, and I like how this activity puts a new twist, and some great new conceptual ideas, on the theme. “Ripped from the headlines”, this lesson challenges students to consider government snooping, and the flagging of perhaps innocent citizens. If a citizen is flagged, what is the probability they are dangerous? How often are we missing potentially dangerous folks in our snooping? What I really liked here was the inclusion of Venn Diagrams, with sets representing “Flagged” and “Dangerous” people, where the group was asked to describe and compare the diagrams. Fascinating discussions, and a good segue into Type I and Type II error for AP Stats if you want to take it that far. This lesson does not appear to be available on the Mathalicious site yet, (update from Mathalicious – will be released in the Fall) but will be using it when it is completed! Later that day, the TMC teachers broke into smaller groups to gain behind-the-scenes access to the Mathalicious writing formula. Thanks to Kate and Chris for sharing, listening, and giving us all the opportunity to contribute ideas.